1. During the Ocean Master Rebate Event 1% of the Rebate Commission will be deposited into member's Main Wallet every day. 2. If there's any mistake from member's data, same IP address, betting on two sides (safety bet/opposite betting) or a series of bets placed by machine, Company reserves the right to withhold the balance, profit and bonus of the account. 1. Promo apply for all new members register with currencies IDR. 2. Minimum Bonus : IDR 100, Maximum Bonus : IDR 1,100. 3. Apply to All SPADEGAMING Slot Games Product except : Non Slot Games (Table Games, Card Games, Video Poker, RNG, etc). 7. No Rebate Commission given during follow the promotion period. 8. If there's any mistake from member's data, same IP address, betting on two sides (safety bet/opposite betting) or a series of bets placed by machine & NON SLOT Games, Company reserves the right to withhold the balance, profit and bonus of the account. 9. Promo Welcome Bonus 100% may not be combine with any other promotions. This promo start from 18th August 2018 12:00:00 (GMT+8). This Promo Apply for QQ3889 member that actively play at least for A MONTH or MORE. Qualified members upgraded to VIP LEVEL are also eligible to receive weeky Commission in accordance with players' VIP LEVEL. The grouping of VIP LEVEL member will be reset every 1st day of every month at 11:00 (WIB). VIP LEVEL, TRANSACTION per DEPOSIT, and TURNOVER from 1st LAST MONTH 11:00 (WIB) until 30th / 31st 23:59:59 (WIB) will be reset and recalculated during this grouping process. All eligible members from TRANSACTION per DEPOSIT and TURNOVER per MONTH will automatically be upgraded to the next level by TUESDAY the FIRST week of EVERY MONTH begins from LEVEL NORMAL. ​If by chance at one point members DID NOT reach the TRANSACTION per DEPOSIT targets or TURNOVER per MONTH targets, then member will be move back to NORMAL LEVEL all over again. TURNOVER are not eligible if member was caught doing SAFETY BET / OPPOSITE BETTING and if there is any mistake from the member's data & same IP. QQ3889 has the right to change or cancel the terms of this promo without prior notice. Please inquire the announcement of members or contact the live chat from time to time to get the latest information. 1. Promo apply for All New Members register with IDR currencies. 1. Promo Start : 10th August 2017 12:00:00 (GMT+8). 2. Apply for All New Members registered in QQ2889 with IDR currencies. 4. Apply to All products except : LIVE CASINO, POKER & PT (Playtech), ISIN4D, OTHER SPORTS and NON SLOT Games (Table Games, Video Poker, RNG, Scratch, Arcade, etc). 6. Withdrawals can be done at anytime and TurnOver can be accumulated to the next deposit. 7. No weekly Rebate Commission given during follow promotion period. 8. BONUS AND THE WINNING IS TAKE BACK IF BETS : ARE ON TWO SIDES (SAFETY BET / OPPOSITE BETTING), OTHER SPORTS and NON SLOT Games. 9. Bonus and The Winning cannot be claimed if there is any mistake from the member's data & same IP. 10. Promo Special Extra Bonus 150% cannot combine with any other promotions. 4. The members whose balance are IDR 0 in playing Slot Games and Scratch Card will receive 100% cashback bonus ( Max Bonus IDR 200 Min Bonus IDR 25). 10. No Rebate Commission given when following the promotion (playing in Slot Games, Arcade and Scratch Card). 1.Promo start : 12th April 2018 12:00:00 (GMT+8). 3.Apply to all members with currencies IDR. 5.Minimum Bonus : IDR 12 Ribu. 6.Maximum Bonus : IDR 2 JUTA Daily (Everyday Member can get Reload Bonus Promo). 12.No Rebate Commission given during follow the promotion period. 1. Promo apply to all members register with currencies IDR. 3. Minimum Bonus : IDR 1. 4. Maximum Bonus : IDR 100K Daily (Everyday Member can get Reload Bonus Promo). 2.Apply to all members with currencies IDR. 4.Minimum Bonus : IDR 1. 5.Maximum Bonus : IDR 100K, MYR 30, VND 200K & THB 250 Daily (Everyday Member can get Reload Bonus Promo). 7.Apply to All Products except : ALLBET, AG, PT (Playtech), POKER, ISIN4D, OTHER SPORTS and NON SLOT Games (Table Games,Card Gamea, Video Poker, RNG, etc). 8.Withdrawals and Transfer can be done if reached the requirement of TurnOver. 9.BONUS & THE WINNING IS TAKE BACK IF BETS : ARE ON TWO SIDES (SAFETY BET / OPPOSITE BETTING), OTHER SPORTS & NON SLOT GAMES. 10.Bonus and The Winning is cancel if there is any mistake of member's data & same IP. 11.No weekly Rebate Commission given during follow the promotion period. 12.General Terms and Conditions apply. 2. We will only process the Cash Rebate upon eligible and successful submission. 3. 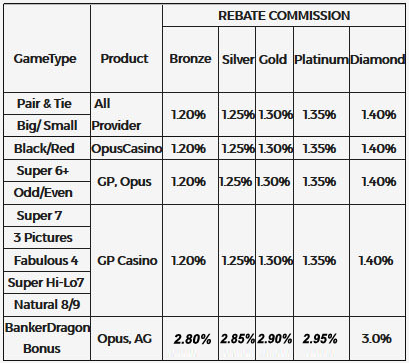 The Rebate Commission Special Bets BACCARAT will be deposited into member's Main Wallet EVERYDAY. 4. General Terms & Conditions apply. 3. The Live Casino Rebate Commission will be deposited into member's Main Wallet everyday. 3. The Sportsbook Rebate Commission will be deposited into member's Main Wallet everyday. 1. Minimum Payout : IDR 1 (seribu rupiah) and UNLIMITED for maximum payout. 1. Minimum Payout : IDR 1. 2. Company will only process the Rebate Commission upon eligible and successful submission. 3.Max payout IDR 500 million. 4. The E-Games Rebate Commission will be deposited into member's Main Wallet everyday. 5. Not apply to Table Games : BLACKJACK, GOLBIN'S CAVE, TRIPLE PROFITS, TROPIC REELS, UGGA BUGGA & OCEAN PRINCESS and MG SLOT (Untamed Bengal Tiger, Untamed Crowned Eagle, Untamed Giant Panda & Untamed Wolf Pack). * Maximum Pay Out BIG WIN SLOT GAMES : IDR 1 Million. 3. The POKER Rebate Commission will be deposited into member's Main Wallet EVERYDAY. 3. The QQKENO Rebate Commission will be deposited into member's Main Wallet everyday.